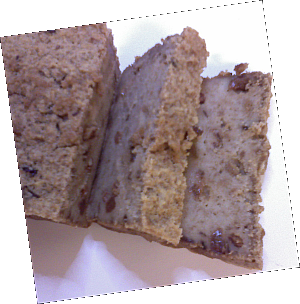 Bread pudding is one of those fabulous stomach fillers that characterize the Great British dessert. It is not quite as filling as the Banoffee Pie that we featured a few weeks ago on this blog. I can finish a plate of bread pudding but the victorious Banoffee Pie stood over my exhausted body and laughed. My mother was taught how to make bread pudding by my grandmother. I learned how to make it from my mother. But the bread pudding I grew up with is fundamentally different to the popular recipes used by modern cooks. The bread pudding I ate as a child was made with a copious quantity of beef suet. The fat literally dripped from the fork. Bread pudding can be made in two ways. One way uses suet. I made it with Atora Light Vegetable Suet which contains 30% less fat than regular beef suet. A healthier alternative is to substitute the suet with eggs. I made that too. 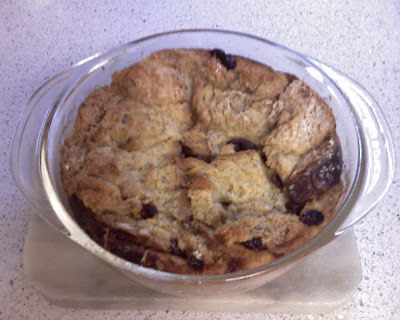 Just for good measure I made a third variety - Bread & Butter pudding. We are going to get fat in my household this week. Thickly butter 3 or 4 slices of bread. Cut the slices into quarters and layer in a baking dish with raisins. The top layer must be bread. Pour on a whisked mixture of 1 cup of milk, 2 eggs, 1/4 cup of sugar, a teaspoon of cinnamon and a teaspoon of nutmeg. Bake at 350degF until the top layer of bread browns. For B&Butter pudding layer buttered bread, mixed fruit, sprinkle with sugar, then same next layer... and then pour over mixed mixed milk & egg formula. Also a good way to use reduced price bread from supermarkets..got some 29p a loaf the other day. I'm in Toronto and didn't know we can get Atora suet here. Butchers don't always have fresh suet; a box of Atora would be easier. Who carries it? My Mum used to cook it until it was dense and moist inside and crunchy around the edges, then she sprinkled castor sugar on top...drool! Atora Beef Suet is not allowed into Canada but Atora Light Vegetable Suet is readily available at most British stores incuding Blighty's. Reply to this comment if you would like to order some. I love bread and butter pudding and I live in Kurdistan North Iraq. For speed I use a sesame seed roll, 2 eggs a little milk and sugar to taste. Whisk altogether and then soak the roll (unbuttered) in the custard mix. I then fry in a little olive oil and it resembles scrambled egg but tastes delicious, just like bread and butter pud.